This is THE magazine that presents all that I need to have to evaluate and buy equipment, know what’s up in the industry, and which provides a listing of DVD reviews and release schedules. In short, it is an almanac for reference, opinion, and knowledge. I must say that I have read just about every magazine that deals with home theatre that has been published. 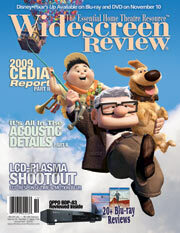 Widescreen is more professional, more comprehensive, and more up-to-date than the rest. I have read the rest, but I am staying with the best.